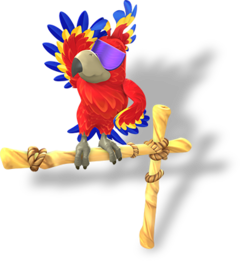 Tawks is a character appearing exclusively in the Nintendo Switch version of Donkey Kong Country: Tropical Freeze. He resembles a scarlet macaw donning a cockatoo crest, similar to a mohawk. He is only present during Funky Mode, where he appears in different stances at Funky's Fly 'n' Buy, depending on what character is played as. While Donkey Kong is controlled, Tawks acts as a figurant character standing behind Funky Kong. While Funky Kong is controlled, Tawks wears a pair of shades and replaces him as the shopkeeper of Funky's Fly 'n' Buy. In this instance, Tawks adopts many of Funky Kong's mannerisms and quotes in an attempt to impersonate him, aided by his cheerful and energetic tone. He offers Funky a discount for all items present in the shop, since they are being sold to the shop owner. Tawks has a similar anatomy to Squawks the Parrot. His name may be a pun on "talks," in order to continue the vocalization-based theme naming with Squawks and Screech. When the player exits the shop as Funky Kong, Tawks will sometimes say, "Give 'em the old banana slamma, dude! ", a reference to Donkey Kong's catchphrase in the Donkey Kong Country animated series. This page was last edited on January 27, 2019, at 07:22.